During her afternoon talk, Campbell-Miller presented the subtle racial and historical dimensions of the Colombo Plan Fellowships and the changing landscape of health education in Canada.The post-doctoral fellow’s talk was the basis for a paper she hopes to publish. Colombo Plan Fellowships: transforming education and practice. Clip 1 from Sandrine Murray on Vimeo. For Canada, the Colombo Plan Fellowships were a first: that is, a humanitarian project driven by economic development for “third world” countries. Canada had never before made a gift of aid for economic development. Colombo Plan Fellowships: transforming education and practice. Clip 2 from Sandrine Murray on Vimeo. When these trainees went home with their sought-after documentation, they also brought with them a whole new set of information to adapt to their own worlds. They were supposed to become educators. But knowing how to use what they learned at, for example, McGill University, wasn’t necessarily easy. 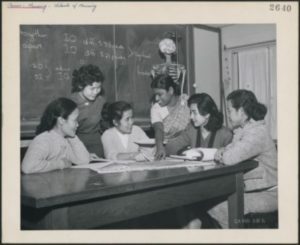 “The context, workload and relationship with superiors was so vastly different between their home country and the country in which they trained,” says Campbell-Miller, quoting a historian specializing in nursing in India. And at first, the Canadian government didn’t necessarily approach the whole project with an upbeat, positive attitude. Colombo Plan Fellowships: transforming education and practice. Clip 3 from Sandrine Murray on Vimeo. What began as a monetary investment on behalf of the Canadian government became a greater development assistance program a few years later. By the 1960s, a vast majority of the South and Southeast Asian geographical area was part of the Colombo plan. It was designed to further the region’s economic well-being and raise living standards. 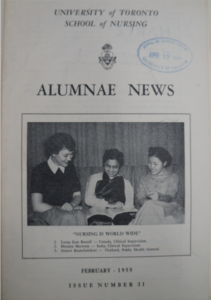 For example, in Canada, the ratio of public health nurses to the population during the 1950s and 60s was around one to 5,000. But in India, multiply the ratio by 10: one to 50,000 was a best case scenario. Colombo Plan Fellowships: transforming education and practice. Clip 4 from Sandrine Murray on Vimeo. As the video above demonstrated, there were racial implications in the whole project as well. The use of “trainee” for those coming in the country– many of whom were already professionals pursuing graduate studies– and the use of “experts” for the Canadians going abroad is an example of this. The program also had other objectives, such as increasing trade. “In some ways the Colombo Plan was really to perform a trickery to get the United States to put money into the region and their valuable dollars, essentially,” she says. But the greatest impact of these fellowships, argued Campbell-Miller, was not on the trainees themselves. Colombo Plan Fellowships: transforming education and practice. Clip 5 from Sandrine Murray on Vimeo. The capital assistance program was the majority of the Canadian budget, but the technical assistance component was the human part of it. All in all, the study of the Colombo Fellowship offers a glimpse into the impact and mindset of Canadian institutions, one that fostered their sense of mission about the role of the fellowships in the expanding field of international health. Colombo Plan Fellowships: transforming education and practice. Conclusion from Sandrine Murray on Vimeo.